The right angle spy lens let you point your camera in one direction yet take pictures 90 degree to the side. The spy lens is simply mounted in front of the camera lens using the filter threads. 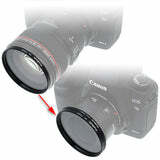 Appearing as a normal lens extension with a reflective fake 'front optic' under the plastic cap, the rotatable barrel allows you to change the direction the camera lens actually sees. It is great for candid photography.